The ending of Steven Spielberg’s Jurassic Park is perfect: The tension, the staging, and the turn of the Tyrannosaurus Rex from villain to hero, complete with the falling banner. It’s so good it seems impossible it could have been handled differently—but history tells us it originally was. Jurassic Park fans likely know there was at least one alternate ending that was pretty close to the one we see in the film. 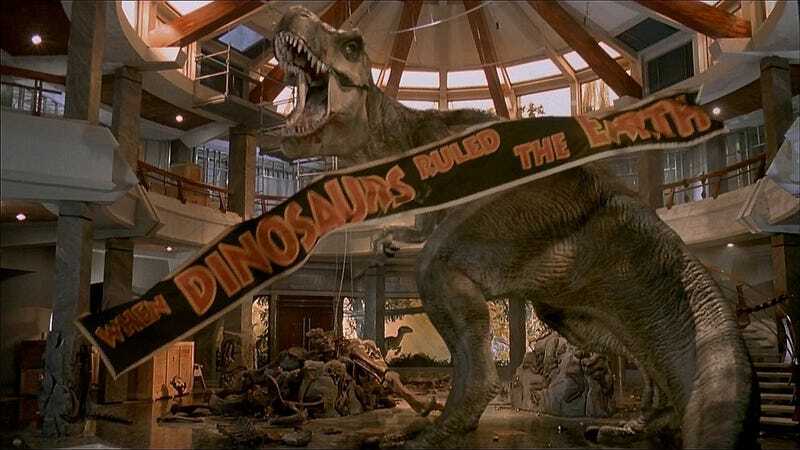 It took place in the main hall, as Alan Grant used a scissor lift and the giant T. Rex skeleton to knock the velociraptors away and escape (you can watch a storyboarded version here). But the living T-Rex was notably absent. A Facebook page called “Jurassic Time” claims to have found effects guru Phil Tippett’s early storyboard binder which features an additional sequence with the T. Rex, presumably intended as part of the alternate ending, or in perhaps even in place of it. The sequence has everyone running for the helicopter to leave the island, only to be confronted by the T. Rex. You can check out the storyboards below. We’ve contacted Universal Pictures, who control the Jurassic rights, as well as Jurassic Time, about the veracity of these boards. According to the person behind the Jurassic Time page, the boards were won in an official Phil Tippett auction so they are as real as they come. Even though we now know these are real, you can tell why this didn’t make the film. It’s super clichéd. Grant jumps on the copter at the last minute! Oh, but the T. Rex grabs the helicopter! Will they get away? Of course they will! It’s a valiant first draft, but what eventually made it to theaters is, without a doubt, the best choice for the end. Update: We heard back from the person behind the source of these boards and have verified their authenticity. We made a few updates above in accordance with that.